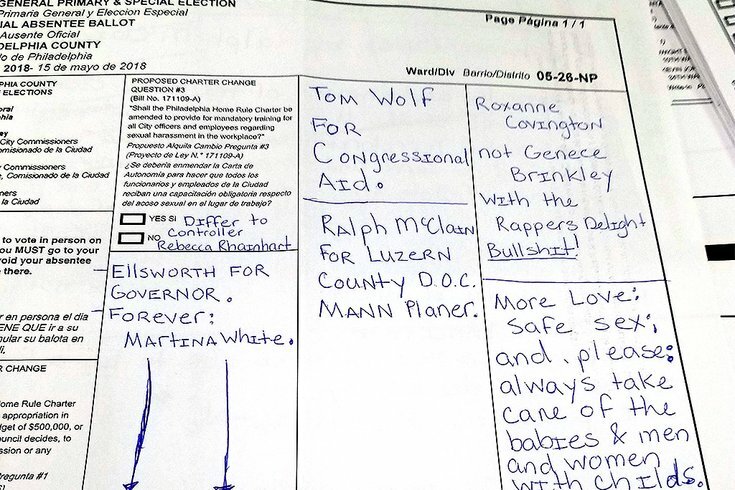 A few of the write-in votes cast in Philadelphia during the recent Pennsylvania primary election. Sure, turnout was light in last week’s primary elections, but that doesn’t mean those who went to the polls didn’t exercise their inalienable right to cast write-in votes. You know what that means? That’s right! It’s time to review the votes that went to people (and other life forms) who weren’t on the official ballot on May 15. The fact that not a single player from the Super Bowl Champion Philadelphia Eagles roster got a vote out of some 7,300 write-ins was rather discouraging. How quickly you people forget. You should be ashamed of yourselves. But enough about that. This year’s batch contained a bunch of the old standards. Let’s take a look at those first, before getting to the deeper issues at hand. Kermit the Frog got a vote for governor, Miss Piggy for a 182nd District statehouse seat and Whoopi Goldberg for U.S. Senate (D), all out of South Philadelphia’s Second Ward. Among votes for the famous were John Travolta (U.S. Senate, Graduate Hospital), Oprah Winfrey (governor, lower South Philadelphia) and Taylor Swift (governor, East Oak Lane/Olney). From the world of sports: boxer Mike Tyson (governor, far Northeast), Phillies centerfielder Odubel Herrera (Republican congressman, West Mt. Airy), former Phillies outfielder Von Hayes (186th district, Graduate Hospital) and Sixers coach Brett Brown (ward executive committee, Graduate Hospital). From the Trump contingent came votes for Donald (governor, lieutenant governor and U.S. Senate, all on the Dem side from a supporter in Packer Park), Ivanka (174th Legislative District, out of Rhawnhurst), The Apprentice contestant Erin Elmore (8th ward executive committee in Center City) and she who needs no introduction, Stormy Daniels (U.S. Senate, South Philly, west of Broad). Marijuana activist N.A. Poe got a vote for Democratic state committee out of Center City. Someone from Fairmount wrote the late Ronald Reagan in for the 195th Legislative District race as a Republican. Mumia Abu Jamal got some support for U.S. Senate out of Southwest Philadelphia. Feeling kind of overthrow-y down in Pennsport was the voter who tapped V.I. Lenin for governor, “Dictatorship at the Proletariat” for state committee (D), "Spectre Haunting Europe" for Congress and Karl Marx for U.S. Senate. Folks even voted for fast-food products this time around. The “Whopper” got votes for governor, lieutenant governor, Democratic state committee, U.S. senate and eighth ward executive committee in Center City. Meanwhile, in the Graduate Hospital area, a “Big Mac” garnered support for a House seat in the 182nd Legislative District. Sticking with that theme of silliness, one thing that really jumped off the 600-plus pages of write-in votes was just how much support was shown for Willie Singletary, the former Traffic Court judge who got in trouble for showing racy pictures to a staffer (among other things, including doing some time). The votes – for U.S. senator, state committee, state house and more – tallied in the dozens. They came from Southwest Philly, Mantua, West Oak Lane, Germantown, Hunting Park, Olney, Manayunk, University City, Point Breeze, Milbourne, Lawncrest, West Philadelphia, Cedarbrook and Mt. Airy. Simply put, despite missing the deadline to get on the ballot, Willy for Philly had the best showing of all write-in candidates during last week’s election. Now, it’s time to close this post with a touch of sadness. It relates to the Republican ward executive-committee seat in Powelton Village. With nobody on the ballot in that race – per election officials – write-in votes would take the prize. 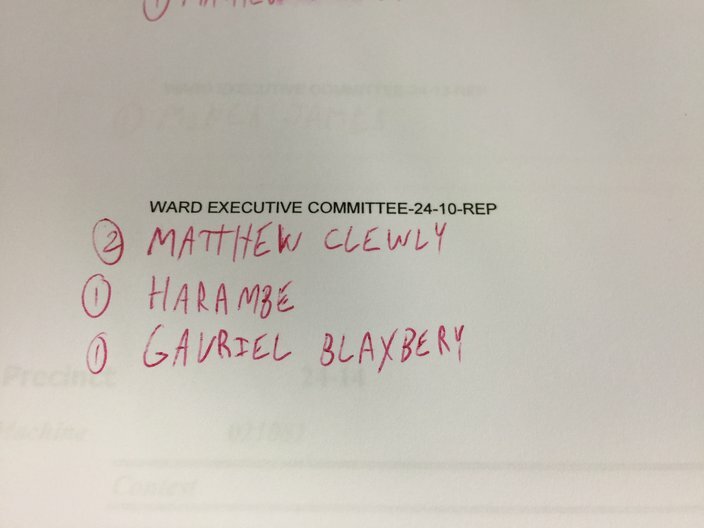 Visual evidence that the late Harambe could have won an elected position in Philadelphia's primary elections, May 15, 2018. Matthew Clewley, who – per LinkedIn – is a finance major at Drexel University currently interning in San Diego, led the way with two votes. In this race, the top two candidates can claim victory. I dropped Clewley a line via Facebook on Wednesday afternoon, but have yet to hear back. If I do, I will update this story accordingly. But I think I speak for him, and for all of us, when I offer heartfelt “RIP Harambe” condolences.